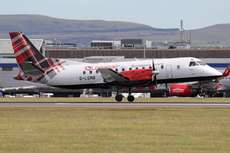 The aircraft took off from Edinburgh Airport, U.K. at 14:02 UTC for a scheduled passenger flight to Sumburgh Airport. The weather forecast showed an occluded front lying to the north of Edinburgh which was moving north-east. There was also an upper level warm front parallel to the occluded front. These fronts brought some rain showers with isolated embedded cumulonimbus clouds in the area around Edinburgh and the initial part of the route north towards Sumburgh. In the climb out from Edinburgh, the aircraft encountered light turbulence in cloud. With the autopilot engaged the aircraft starting pitching up and down to maintain the selected IAS. Suddenly the turbulence intensified and ice began to form quickly on the aircraft. The stick shaker activated and the autopilot disconnected. The co-pilot, who was pilot flying (PF), attempted to accelerate the aircraft by reducing the pitch attitude. He then re-engaged the autopilot but, after 13 seconds, the stick shaker activated again and the autopilot disconnected. Shortly afterwards, the stick shaker activated for a third time and the co-pilot began a descent to accelerate the aircraft. The aircraft lost around 500ft during the manoeuvre during which it accelerated and recovered to normal flight. The crew did not select maximum continuous power during the recovery. After encountering severe icing, probably associated with a CB, the Saab340 stall warning system functioned as it was designed to by alerting the crew, through the stick shaker, of an AOA in excess of 5.9°. The crew actions did not initially address the problem sufficiently and the stick shaker occurred again. Following the third activation of the stick shaker the crew descended the aircraft to regain a safe airspeed. Although maximum power was not set, the aircraft did accelerate and the crew were able to clear the icing and turbulent conditions before continuing their flight without further incident.